The objective of the study is to reveal the mathematical reasoning skills of 7th grade secondary school students towards PISA questions. This research has been conducted during the academic year of 2016-2017. The study was carried out with 51 students in total, from a province in the Black Sea region of Turkey by using random sampling method. Case study method was employed in this study. The reasoning statements expressed by students during problem-solving were analyzed via content analysis method. The problem called Energy Needs from the Chapter 1 of normal units, which is named Problem Solving Questions from PISA (Program for International Student Assessments) (2015), as the data collection tool for the study. This is a two phased problem, which includes two separate problems. The problems were evaluated and analyzed according to mathematical reasoning problem solving skills of NAEP (2002). In the first phase, which determines whether students use problem-solving strategies, the data related to the problem, and the related mathematical information, the findings suggest that the students wrote down the data related to the problem and clearly determined what was expected from them. It was observed that the students used their knowledge by mathematically associating what was expected from them with the information provided in the problem. In the second phase, which determines whether students use reasoning skills, the findings suggest that students used their inductive, deductive, statistical, and proportional reasoning skills while solving the problems. In the third and last phase, which determines whether students have delivered the correct decision on their solution's convenience and accuracy after solving the problem, it is observed that majority of the students checked the accuracy of their solution and crosschecked to determine whether they correctly solved the problem. Çalışmanın amacı 7. sınıf ortaokul öğrencilerinin PISA soruları karşısında muhakeme becerilerini ortaya çıkarmaktır. Çalışma, 2016-2017 eğitim öğretim dönemi bahar yarıyılında gerçekleştirilmiştir. Çalışma grubunu Türkiye’nin Karadeniz bölgesinde bulunan bir ilden rastgele örnekleme yöntemi ile seçilen toplam 51 öğrenci oluşturmaktadır. Bu çalışmada durum çalışması yöntemi kullanılmıştır. Öğrencilerin problemleri çözerken ortaya koymuş oldukları muhakeme becerileri içerik analizi ile çözümlenmiştir. Çalışmada veri toplama aracı olarak PISA (Program for International Student Assessments) Örnek Problem Çözme Sorularından (2015) normal üniteler adlı bölüm 1’den Enerji Gereksinimleri adlı problem kullanılmıştır. Bu problem iki bölümden oluşmaktadır. Uygulanan problemlerden elde veriler NAEP’in (2002) matematiksel muhakeme ve problem çözme becerisi kriterlerine göre değerlendirerek analiz edilmiştir. Elde edilen bulgular incelendiğinde öğrencilerin problem çözme stratejilerini, probleme ait verileri ve istenilen ile ilişkili matematik bilgilerini kullanıp kullanılmadığını belirlenmesi aşamasında öğrencilerin probleme ait verileri yazdıkları ve istenilenleri net bir şekilde belirledikleri görülmektedir. Ayrıca öğrencilerin istenilenler ve verilenler arasında matematiksel bir ilişki kurarak bilgilerini kullandıkları belirlenmiştir. Öğrencilerin muhakeme becerilerini kullanıp kullanmadıklarının incelendiği ikinci adımda öğrencilerin problemi çözerken tümdengelime dayalı, tümevarıma dayalı, istatiksel ve orantısal muhakeme becerilerini kullandıkları görülmektedir. Son aşama değerlendirildiğinde ise öğrencilerin problemin çözümünden sonra çözümün uygunluğu ve doğruluğu ile ilgili karar verebilme esnasında öğrencilerin çoğunluğunun çözümlerinin doğruluğunu kontrol ettiklerini ve doğru olup olmadığını belirlemek için sağlama yaptıkları belirlenmiştir. Altıparmak, K. & Öziş, T. (2005). Matematiksel İspat ve Matematiksel Muhakemenin Gelişimi Üzerine bir inceleme. Ege Eğitim Dergisi, 6,1, 25-37. Altun, M., Sezgin Memnun, D., & Yazgan, Y. (2007). Sınıf Öğretmeni Adaylarının Rutin Olmayan Matematiksel Problemleri Çözme Becerileri ve Bu Konudaki Düşünceleri. İlköğretim Online, 6,1, 127-143. Arsac, G. (2007). Origin of mathematical proof. In P. Boero (Ed. ), Theorems in school: From history, epistemology and cognitionto classroom practice (27–42). Rotterdam, The Netherlands: Sense Publishers. Arslan, Ç., ve Altun, M. (2007). Learning to solve non-routine mathematical problems. İlköğretim Online, 6 (1), 50-61. Baki, A. (2014). Matematik tarihi ve felsefesi. Ankara: Pegem A Akademi. Bal-İncebacak, B., ve Ersoy, E. (2016a). 7. sınıf öğrencilerinin matematiksel muhakeme becerilerinin TIMSS’e göre analizi. Uluslararası Sosyal Araştırmalar Dergisi, 9(46), 474- 481. Bal-İncebacak, B., ve Ersoy, E. (2016b). Problem solving skills of secondary school students, China-USA Business Review, 15(6), 275-285 doi: 10.17265/1537-1514/2016.06.002 Ball, D. (1996). Teacher learning and the mathematics reforms: What we think we know and what we need to learn. Phi Delta Kappan, 77, 500-508. Ball, D., & Cohen, D. (1999). Developing practice, developing practitioners: Toward a practice-based theory of professional education. In L. Darling-Hammond & G. Sykes (Eds. ), Teaching as the learning profession: Handbook of policy and practice (3-32). San Francisco: Jossey-Bass. Ball, L., Stacey, K., & Pierce, R. (2001). Assessing algebraic expectation. In J. Bobis, B. Perry, M. Mitchelmore (Eds. ), Numeracy and Beyond. Proceedings of the 24th Annual Conference of the Mathematics (66 – 73), Education Research Group of Australasia, Sydney. Baykul, Y. (2014). Ortaokulda matematik öğretimi (5-8. Sınıflar) (2. Baskı). Ankara: Pegem Akademi Yayıncılık. Baykul, Y. (Ed.) (2010). Problem çözme stratejileri. Konya: Gençlik Kitabevi Yayınları. Chazan, D. (1993). High school geometry students’ justification for their views of empirical evidence and mathematical proof. Educational Studies in Mathematics, 24 4, 359-387. Christensen, L. B., Johnson, R. B., & Turner, L. A. (2015). Research methotds desing and analysis, A. Alpay (Çev. Edt. ), Qualitative and mixed methods research [Nitel ve karma araştırma yöntemleri], (400- 434), Ankara: Anı Yayıncılık Coe, R., & Ruthven, K. (1994). Proof practices and constructs of advanced mathematics students. British Educational Research Journal, 20 1, 41-53. Dituri, P. (2013). Proof and reasoning in secondary school algebra textbooks. (Unpublised Doctor of thesis). Graduate School of Arts and Sciences, Columbia Unıversity: United States Code, ProQuest LLC. Dominowski, R.L., and Bourne, L.E. (1994). History of research on thinking and problem solving R. J. Sternberg. (Ed.). Thinking and problem solving. (pp.1-33). California: Academic Press. EARGAD (2010). PISA 2009 projesi ulusal ön raporu. Milli Eğitim Bakanlığı Eğitimi Araştırma ve Geliştirme Dairesi: Ankara Empson, S., & Junk, D. (2004). Teachers’ knowledge of children’s mathematics after implementing a student-centered curriculum. Journal of Mathematics Teacher Education, 7, 121-144. Ersoy, Y. (2006). Innovations in mathematics curricula of elementary schools-1: objective, content and acquisition. Elementary Education Online, 5 1, 30-44. Eves, H. (1990). An introduction to the history of mathematics (6th ed.). Philadelphia, PA: Saunders College Publishing. Featherstone, H., Smith, S., Beasley, K., Corbin, D., & Shank, C. (1995). Expanding the equation: Learning mathematics through teaching in new ways. East Lansing, MI: National Center for Research on Teacher Learning. Francisco, J. M., and Maher, C. A. (2005). Conditions for promoting reasoning in problem solving: ınsights from a longitudinal study. Journal of Mathematical Behavior, 24, 361–372. Glesne, C. (2012). Becoming qualitative researchers. A. Ersoy & P. Yalçınoğlu (Çev. Ed. ), Nitel Araştırmayla tanışma [Browse meet with qualitative] (1- 36). Ankara: Anı Yayıncılık. Gözen, Ş. (2000). Matematik √e öğretimi. Ankara: Evrim Yayınevi Greeno, J. G. (1991). Number sense as situated knowing in a conceptual domain. Journal for Research in Mathematics Education, 22, 170-218. Hiebert, J., Carpenter, T. P., Fennema, E., Fuson, K., Wearne, D., Murray, H., Olivier, A., & Human, P. (1997). Making sense: Teaching and learning mathematics with understanding. Portsmouth, NH: Heinemann. Işık, C., ve Kar, T. ( 2011). İlköğretim 6, 7 ve 8. sınıf öğrencilerinin sayı algılama ve rutin olmayan problem çözme becerilerinin incelenmesi, Ahi Evran Üniversitesi Eğitim Fakültesi Dergisi, 12(1), 57-72. Jacobs, V. R., & Ambrose, R. C. (2003, April, 22 ). Individual interviews as a window into teachers' practice: A framework for understanding teacher-student interactions during mathematical problem solving. Paper presented at the American Educational Research Association annual meeting, Chicago. Jbeili, I.M.A. (2003). The Effects of Metacognıtıve Scaffoldıng and Cooperatıve Learnıng on Mathematıcs Performance and Mathematıcal Reasonıng Among Fıfth-Grade Students ın Jordan. http://www.scribd.com/doc/99696/Excellent- Thesis-Metacognitive-Scaffolding-and-Cooperative-Learning- Karplus, R., Pulos, S., & Stages, E. K. (1983). Proportional Reasoning of Early Adolescents, Tesh, R. A., & Landau, M. (Eds. ), ACQuisition of Matmematics Concepts and Processes, Academic Press:USA. Lannin, J. K. (2001). Developing middle school students' understanding of recursive and explicit reasoning, (Unpublised Doctor of thesis). Thesis.Illinois State University, Illinois. Lynn Junk, D. (2005). Teaching mathematics and the problems of practice: understanding situations and teacher reasoning through teacher perspectives. (Unpublised Doctor of thesis). The University of Texas at Austin, Austin. Math-CATs (The Mathematical Thinking Classroom Assesment Techniques) (2007). http://www.flaguide.org/cat/math/math/math7.php Nisan 2010 tarihinde ulaşılmıştır. Miles, M. B., & Huberman, A.M. (1994). Qualitative data analysis: A sourcebook of new methods (2nd ed.). Thousand Oaks, CA: Sage. Moore, R. C. (1994). Making the transition to formal proof. Educational Studies in Mathematics, 27 3, 249-266. National Council of Teachers of Mathematics (NCTM). (1989). Curriculum and evaluation standards for school mathematics. Reston: Virginia. National Council of Teachers of Mathematics (NCTM). (1999). Developing mathematical reasoning in grades K-12. National Council of Teachers of Mathematics, Reston, VA. National Council of Teachers of Mathematics (NCTM). (2000). Principles and standards for school mathematics. Reston, VA. Patton, M. Q. (2014). Qualitative research and evaluation methods. M. Bütün & S. B. Demir (Çev. Eds. ), Analysis, Review and Preparation for publication [Analiz, Yorum ve Raporlaştırma] (429-534). Ankara: Pegem A Akademi PISA (2012). PISA 2012: Türkiye üzerine değerlendirme ve öneriler. Ankara: Öncü Basımevi PISA (2015). PISA 2012 Araştırması Ulusal Nihai Rapor. (D. Anıl, Y. Ö. Özkan, E. Demir). Ankara: İşkur Matbaacılık. PISA (2015). Uluslararası Öğrenci Başarılarını Değerlendirme Programı - Örnek Problem Çözme Soruları. (1-77), Ankara Milli Eğitim Bakanlığı: Ölçme Değerlendirme ve Sınav Hizmetleri Genel Müdürlüğü. Pilten, P. (2008) Üstbiliş Stratejileri Öğretimin İlköğretim Besinci Sınıf Öğrencilerinin Matematiksel Muhakeme Becerilerine Etkisi. Yayımlanmış Doktora Tezi, Gazi Üniversitesi, Eğitim Bilimleri Enstitüsü, İlköğretim Anabilim Dalı, Ankara. Reiss, K., & Renkl, A. (2002). Learning to prove: The idea of heuristic examples. Zentralblatt für Didaktik der Mathematik, 34 1, 29- 35. doi:10.1007/BF02655690 Scharm, T. (2006). Conceptualizing and proposing qulitative research (2nd ed). Upper Saddle River, NJ: Pearson Education, Inc. Schliemann, A. D., and Carraher, D. W. (2002). The evolution of mathematical reasoning: everyday versus ıdealized understandings. Developmental Review, 22(2), 242-266. Steinberg, R. S., Empson, S., & Carpenter, T. P. (2004). Inquiry into children's mathematical thinking as a means to teacher change. Journal of Mathematics Teacher Education, 7, 237–267. Stylianou, D., Blanton, M., & Knuth, E. (Eds.). (2009). Teaching and learning proof across the grades. New York, NY: Routledge. Umay, A. (2003). Matematiksel muhakeme yeteneği. Hacettepe Eğitim Fakültesi Dergisi, 24, 234- 243. Umay, A., & Kaf, Y. (2005). Matematikte kusurlu akıl yürütme üzerine bir çalışma. 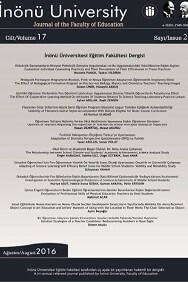 Hacettepe Üniversitesi Eğitim Fakültesi Dergisi,28, 188-195. Webster (1986). Webster’s third new international dictionary of the English language. Chicago: Encyclopaedia Britannica, Inc Yang, D. (2005). Number sense strategies used by 6th-grade Students in Taiwan. Educational Studies, 31(3), 317-333.